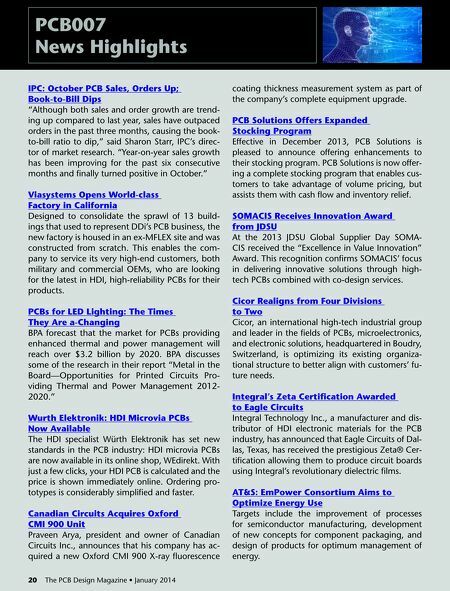 PCB007 News Highlights IPC: October PCB Sales, Orders Up; Book-to-Bill Dips "Although both sales and order growth are trending up compared to last year, sales have outpaced orders in the past three months, causing the bookto-bill ratio to dip," said Sharon Starr, IPC's director of market research. "Year-on-year sales growth has been improving for the past six consecutive months and finally turned positive in October." Viasystems Opens World-class Factory in California Designed to consolidate the sprawl of 13 buildings that used to represent DDi's PCB business, the new factory is housed in an ex-MFLEX site and was constructed from scratch. This enables the company to service its very high-end customers, both military and commercial OEMs, who are looking for the latest in HDI, high-reliability PCBs for their products. PCBs for LED Lighting: The Times They Are a-Changing BPA forecast that the market for PCBs providing enhanced thermal and power management will reach over $3.2 billion by 2020. BPA discusses some of the research in their report "Metal in the Board—Opportunities for Printed Circuits Providing Thermal and Power Management 20122020." Wurth Elektronik: HDI Microvia PCBs Now Available The HDI specialist Würth Elektronik has set new standards in the PCB industry: HDI microvia PCBs are now available in its online shop, WEdirekt. With just a few clicks, your HDI PCB is calculated and the price is shown immediately online. Ordering prototypes is considerably simplified and faster. Canadian Circuits Acquires Oxford CMI 900 Unit Praveen Arya, president and owner of Canadian Circuits Inc., announces that his company has acquired a new Oxford CMI 900 X-ray fluorescence 20 The PCB Design Magazine • January 2014 coating thickness measurement system as part of the company's complete equipment upgrade. 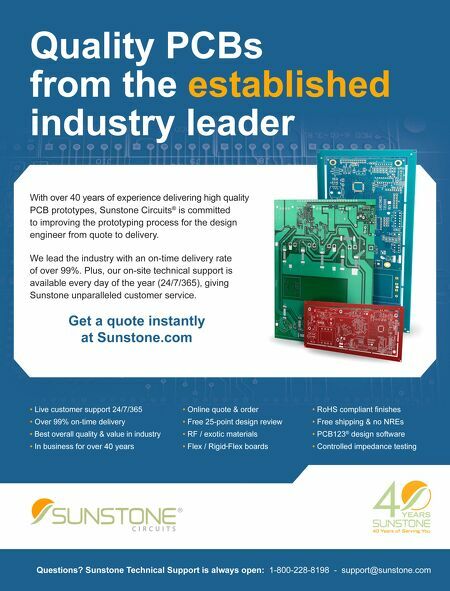 PCB Solutions Offers Expanded Stocking Program Effective in December 2013, PCB Solutions is pleased to announce offering enhancements to their stocking program. PCB Solutions is now offering a complete stocking program that enables customers to take advantage of volume pricing, but assists them with cash flow and inventory relief. SOMACIS Receives Innovation Award from JDSU At the 2013 JDSU Global Supplier Day SOMACIS received the "Excellence in Value Innovation" Award. This recognition confirms SOMACIS' focus in delivering innovative solutions through hightech PCBs combined with co-design services. Cicor Realigns from Four Divisions to Two Cicor, an international high-tech industrial group and leader in the fields of PCBs, microelectronics, and electronic solutions, headquartered in Boudry, Switzerland, is optimizing its existing organizational structure to better align with customers' future needs. Integral's Zeta Certification Awarded to Eagle Circuits Integral Technology Inc., a manufacturer and distributor of HDI electronic materials for the PCB industry, has announced that Eagle Circuits of Dallas, Texas, has received the prestigious Zeta® Certification allowing them to produce circuit boards using Integral's revolutionary dielectric films. AT&S: EmPower Consortium Aims to Optimize Energy Use Targets include the improvement of processes for semiconductor manufacturing, development of new concepts for component packaging, and design of products for optimum management of energy.